Guess what!? Today I have a wonderful box to show you and this one is perfect for the summers! This is the May 2015 Beautywish Box from The Nature’s Co and it is called the “Holiday Primp” Box! We are already halfway through 2015 and June is the month of Summer Vacations! And who doesn’t want to look picture ready and glam on a vacay, right!? And the Holiday Primp box has everything you need to look super gorgeous on your vacation or even stay-cation for that matter! I received it just yesterday and have not used any of these but I will collectively review the sample and the one full size product this cute little pink bag holds, later! For now, let’s see what all is there in the box bag. 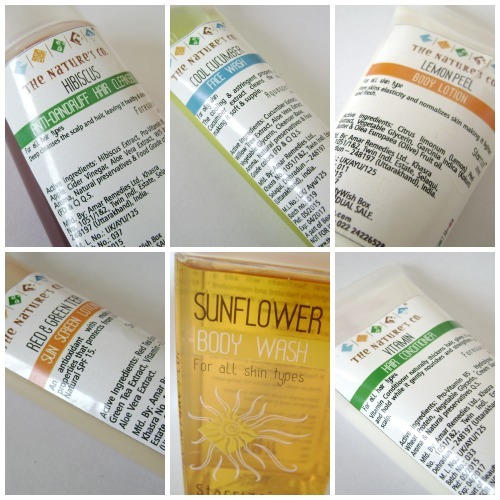 The Nature’s Co. Sunflower Body Wash: - This is the full sized product in this bag and this costs 545 INR for 250ml! This body wash is for all skin types. The Nature’s Co. Lemon Peel Body Lotion: -This is a 30ml sample , I think it would last for a good few times because it is required very less. It has a very feebly lemon fragrance. This is for all skin types. The Nature’s Co. Cool Cucumber Face Wash:- a 20ml sample has a nice and fresh cucumber fragrance. This is for oily skin. The Nature’s Co. Vitamin Hair Conditioner: - 30ml sample of the conditioner which contains Pro- vitamin B5 which is also called Pantothenic Acid. I am very excited to try this out! It is believed that Pantothenic acid helps strengthen hair follicles and also helps the scalp to get rid of dead cells! The Nature’s Co. Red and Green Tea Sun Screen Lotion: - a 20ml sample. It claims to have natural SPF 15 so I am looking forward to trying this as well! The Nature’s Co. Hibiscus Anti Dandruff Hair Cleanser: - a 30 ml sample of their best seller product. This is for all hair types and I must have told you before, when I gave you the recipe of the home made hair mask for anti damage and anti dandruff, that a hibiscus flower has a lot of power to make your hair beautiful! For all hair types! And last but not the least (I think it’s the best part of the box!) the pretty, hot pink makeup bag, with a cute little mirror! This bag is whatever the name claims and more! 5 decent sample size product with one full size product along with the makeup/travel bag for just 595 INR is pretty great! And every single product is inline with the theme of the month! You will need each of these things when you are out holidaying on a beach or somewhere in the mountains! I would highly recommend the beautywish box to you! Because I was not disappointed with it at all! You can get yours from here , stay tuned for the review of the products. *PR sample. Honest review as always .